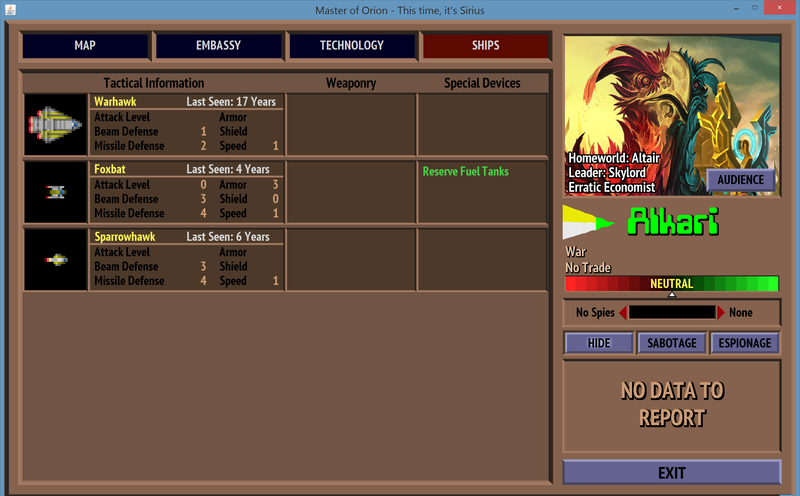 In the original Master of Orion, you could scan ships in battle and see their full statistics. Unfortunately, that information was retained nowhere for the player to review later, especially when needing to build ships to counter the enemy’s in combat. 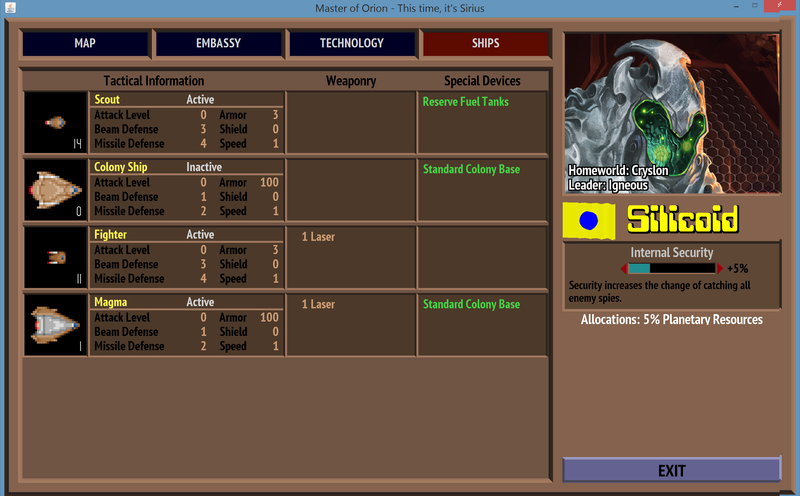 In Java MOO, any enemy ship information gathered is retained and viewable under the “Races” tab. For example, in the screenshot below you can see that one ship has been scanned (full data) while the other has simply been observed. In addition, you can view your own ships in this UI as well. Of course, all ships are treated as fully scanned. In addition, the total number of ships you have is designed next to the ship’s icon. I just need to do a few small touch-ups like scrolling and this one will be essentially done. that is a really nice added value. – can you browse the various races from this screen, for example by clicking somewhere you will continue to the next race? – what happens to list of opponents’ vessels if one/some of their ships is destroyed by another opponent (not yourself). Are these ships deleted? (and in that sense info is relayed in this screen that there was a battle) or is the ship simple never seen again and it stays in list as an aging item? 1) Navigating to another race can be done by clicking on the “Map” section and selecting the empire you want to review. I’ve had trouble trying to find a way to make it easier to navigate without cluttering up the UI. However, this method works pretty well. 2) This is a list of all ships you have seen, not all ships currently active. Any ships that are destroyed in combat or have had their designs scrapped will stay in the list as aging items. How much information you gather about a ship depends on how you have interacted with it. A battle scan reveals everything. Being in orbit (but not scanning) reveals less information. Detecting with long-range scanners reveals even less. Any technologies used in the ship that your race is not familiar with are shown as, for example, “Unknown weapon” or “Unknown device” or “???”. However, if a ship attacks you in combat with an unknown weapon, it is revealed to you at that point. For example, an “Unknown Device” may become “Black Hole Generator” when you see it in action.